The Fellowship was fortunate enough to obtain a copy of LI’L DEPRESSED BOY #14 from Image Comics. The story is by S. Steven Struble, with art by Sina Grace. Li’l Depressed Boy (LDB) must keep the secret that he is dating his boss Spike. TJ has figured it out, but promised to LDB that the secret is safe with him. Later while cleaning trash cans with TJ, LDB dislocates his right shoulder. Toby, who feels that LDB is faking, takes him home where Spike comes by and checks up on him. Halloween finds LDB working a double shift at the cinema as the ticket taker position due to his injury. He is called away to the storeroom by Spike who wants to checkup on him. Unfortunately, the tender moment is interrupted by Toby, who now suspects something is going on between the two. Unfortunately, I have not encountered this book before and it’s my loss. I like the interesting twist of the lead character does not look human while everybody else does. Could this me his impression of himself? The artwork is simple (I mean that in a good way). It totally fits in with the characters and the story. I need to get the trades and catch up on this interesting little series. 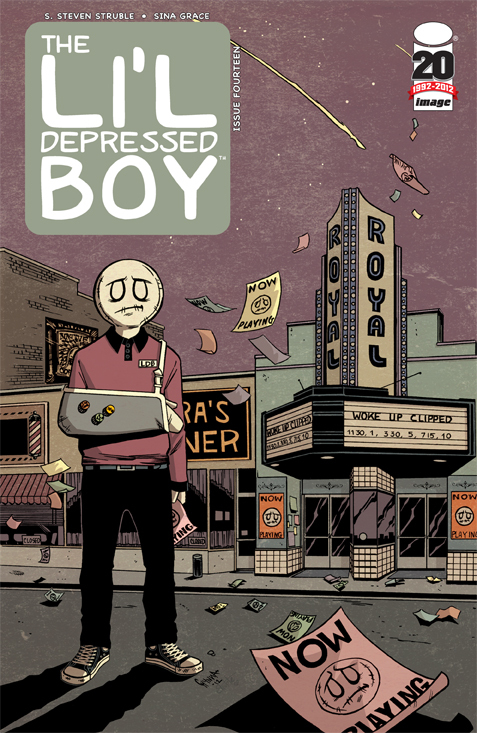 LI’L DEPRESSED BOY #14 is in stores now and available at www.imagecomics.com.